I love how easy it is to put together. 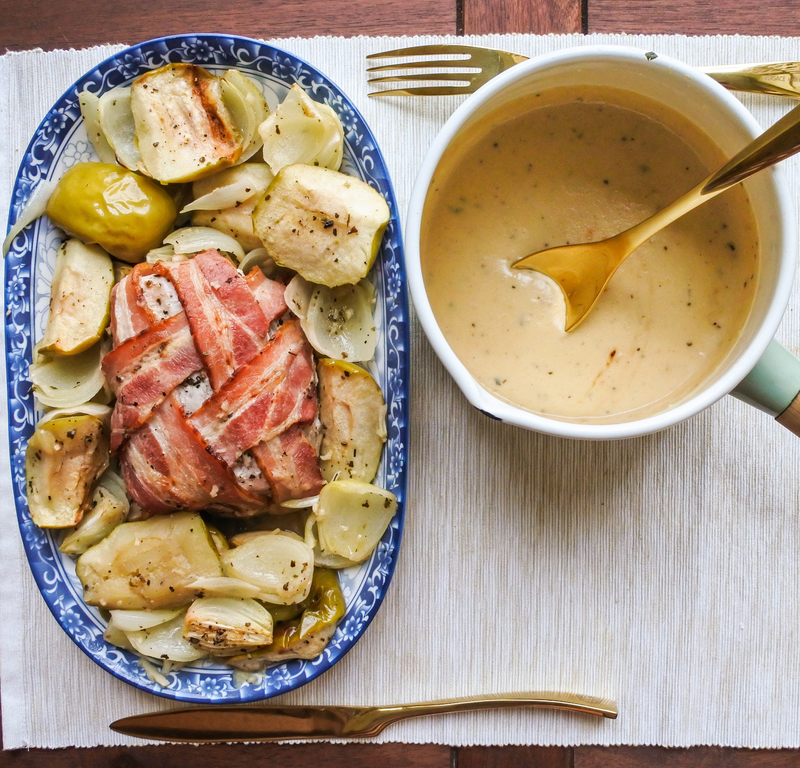 Cut up the apples and onions, place them around a pork loin coated in cider and sage, wrap in bacon and roast until juicy and tender. Make an amazing sauce out of the juices. I love the complexity of flavors: not too sweet, not too salty. Everything compliments and heightens the flavor of each ingredient in the most delicious way. The saltiness of the bacon, the tang of the apple cider, sweetness of the roasted apples and onions and the juiciness and flavor of the pork. I love how it looks. Who can say no to a succulent roast surrounded by, what is essentially, Autumn on a plate. Drizzle it with the creamy sauce and you’ve got yourself a beautiful plate of food. Who could resist? Place pork loin in the center of a casserole dish surrounded by quartered apples and onions. Over medium heat, melt butter with sage and minced garlic. Let cook until fragrant (be careful not to burn garlic) then add the can of hard cider. Increase heat to high and let bubble away until reduced by half. Drizzle cider and sage sauce over the pork loin, apples and onions. Toss together until everything is evenly coated in sauce. Season generously with salt and pepper. Cover pork loin with strips of bacon. Bake in the oven for 45 min-1 hour. Temperatures will vary with every oven so rely on a meat thermometer to tell you when the pork is ready. The temperature of the center of the loin should reach 145F/63C. Check it after 45 minutes to see if pork is cooked through and if not continue cooking and check again after 10-15 minutes. Be careful not to overcook as pork easily becomes dry when overcooked. When pork, apples and onions are finished roasting, remove loin, onions and apples from casserole dish and place on a serving dish. Transfer roasting juices from the casserole dish to a medium sauce pan. Add 1 cup (240 ml) of chicken broth and bring to a boil over high heat. Let bubble for 3-5 minutes. Reduce heat to low, add 120 ml (4 oz) cream mixed with 2 tsp of flour. Stir in let simmer for a minute or so until sauce thickens then add 1 tbsp of Dijon mustard. Mix until thoroughly combined. Let simmer for a minute then remove from heat. Season with salt and pepper to taste. Wash and dry apples. Peel outer shell off onion and cut off the ends. Remove core from apples and cut into quarters. Cut onions into quarters as well. I recommend using a dry, hard apple cider for this dish. You can substitute apple juice or non-alcoholic cider for this but don’t substitute with wine because you want get the same flavor. When sauce has been reduced by half, turn off heat. Drizzle cider and sage sauce over the pork loin, apples and onions. Toss together until everything is evenly coated in sauce. Transfer roasting juices from the casserole dish to a medium sauce pan. Add 1 cup (240 ml) of chicken broth and bring to a boil over high heat. Let bubble for 3-5 minutes. Add 1 tbsp of Dijon mustard. Mix until thoroughly combined. Let simmer for a minute then remove from heat. Season with salt and pepper to taste (you might not need a lot of salt or pepper so taste first and decide).